Withers said he was questioned about the bombings but none of his family was notified about where he was. After Conditt died, Thomas was eventually released. Police earlier said they’d released Conditt’s other roommate but refused to name him. Austin police spokeswoman Anna Sabana said neither roommate has been charged. She said her son “seemed to get along fine” with Conditt. “Collin said they all would sit around and chat and talk,” she said. But Withers said her son didn’t know anything about the bombs police say he made. They now say they don’t know what motivated Conditt. 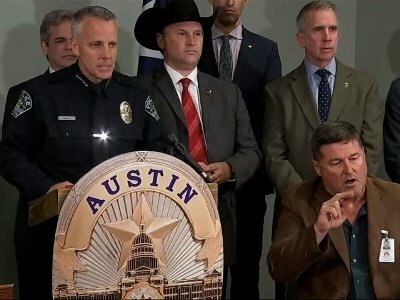 He planted bombs in different parts of Austin that killed two people and severely wounded four others over three weeks starting on March 2. He began by placing explosives in packages left overnight on doorsteps, then rigged an explosive to a tripwire along a public trail. Finally, he sent two parcels with bombs via FedEx. The second bomb exploded on March 12, killing 17-year-old Draylen Mason and severely wounding his mother. Mason was a talented bass player, and Michael Manderen, admissions director for the Oberlin Conservatory of Music in Ohio, said Mason had earned a highly coveted spot in the program before his death and would have been told Friday along with others accepted. Conditt, who was unemployed, home-schooled and a community college dropout, made a 25-minute cellphone recording before his death. It was recovered after he detonated one of his own bombs along the side of Interstate 35 just outside of Austin as a SWAT team moved in. But investigators say the recording provides few clues as to Conditt’s motives — and they’ve refused to release it, citing the ongoing investigation. Conditt eventually was tracked down through store surveillance video, cellphone signals and witness accounts of a customer shipping FedEx packages in a disguise that included a blond wig and gloves. Deputy U.S. Marshal Darren Sartin, supervisor of the Lone Star Fugitive Task Force, said his team found Conditt’s vehicle in the parking lot of a hotel outside Austin around 2 a.m. Wednesday. Sartin said the task force arrests hundreds of people every year, but has never seen a fugitive detonate a bomb. NAACP Austin President Nelson Linder said public still needs answers on what motivated Conditt, including whether the first two victims were targeted because they are from prominent black families.